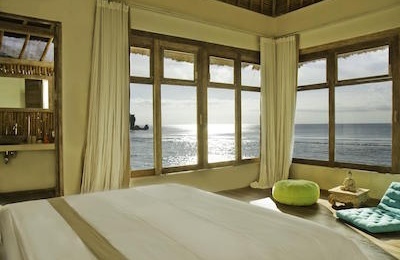 Krui Surf Camp - Lampung, Sumatra Guests overall rating: ★★★★★ 5 based on 3 reviews. Krui Surf Camp is surrounded by beautiful sandy beaches and some of the best surf spots Sumatra has to offer, it is a family-owned business located in the heart of Krui. 20 years of experience in and around the Island of Sumatra helped us set our style of combining Indonesian vibes with western high comfort. Our main goal is to provide a fun environment for you, in which you can relax after a long surf-session or after one of the other numerous activities our team can organize for you. To make your stay at Krui Surf Camp one of the best trips of your life, we have a few things to offer: an all-day open bar serving the coolest Bintang in South Sumatra, a pool and a tennis table, a yoga area where you can take yoga classes, a newly built pool area, a place to relax, and a place where you can get your long-awaited massage. Besides that, you will be provided with free high-speed WiFi, airport and activity transfers and some of the best and most secret insights from our local staff. We offer double rooms, which can be expanded to rooms for 3 people at an additional charge. Each room is equipped with a mosquito net, a spacious bathroom, western-style toilets, an air-conditioner or a fan, a private terrace, and a space to stow your surfboards or other equipment. Krui Surf Camp is directly in the middle of all the Surf Spot, directly at the Sea. If you surfer or non-surfer there are a lot of activities for you and after all modern rooms for maximum 2 Person. One Time in the Week is Barbeque Day there a lot of Surfers from other Accomodation come for join us because we have a Bar Area inside in the Camp. In Krui you cant find Bar´s, Cafe´s and it is forbidden to drink outside of a Camp Alcohol. We offer Bintang ( Beer) in the Camp, that´s legal. We have a Ding Repair, and work with all the local Surfers from Krui together. They are hanging around in our Bar Area to give the best information and if the tourist want for spend the surf sessions together. We speak English, German and Indonesia. It´s directly at the Beach. We have a Supermarket we have in our Camp Area inside. The way from the Bandar Lampung Airport Sumatra to the camp is in the price included. "The stay was a real pleasure, everything is kept easy (muslim toilets, nice veranda to hang out, billard table, ping pong table), but you have everything you need. The breakfast can be included and is really good. The owner is helpful and has an answer for every question you'll ask. Perfect place for surfer's (krui left is 20 meters to the beach) and other surfspot like the peak are really close. I enjoyed my stay and would definitely recommend it. Cheers, Julian "
Local atmosphere, Indonesian vibes and some Western comfort! "Staying at Krui Surf Camp during my Sumatran surf trip contributed to this being the best surf trip I've done. With a bunch of different reef breaks right out the front, a beachbreak 15 mins scooter drive away and a lot more reef breaks in within an hour drive, the location is perfect. Travelling solo, I felt really comfortable staying in one of the single cabins which, because of their natural wooden interior, gave me the jungle vibe I expected getting in South Sumatra. In addition to that I had the nicest view of the wave ‘Krui Left’ from the veranda just outside my room. The common areas have been designed to be more than just a place to stay. Most of the time I ended up chatting with the other guests in a nice and comfy relaxing area right next to the bar, or playing pool or table tennis, drinking a cool beer. Christian and his wife Yuli are excellent hosts and along with their partner Florian and their friendly staff they work hard to ensure, that there are no reasons for complaints. Compared to other places in Sumatra I had the feeling that the food they provided was a little bit too expensive but they said they would work on that and because the hostel is located really close to the center of Krui there’s always the option of eating out. 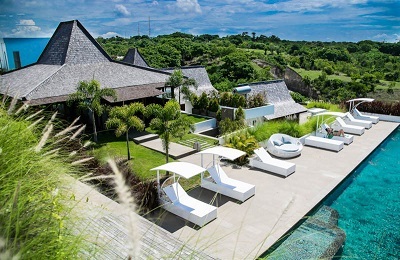 Another fact, that really impressed me is, that the owner is super engaged in social and environmental projects. Telling him, that I brought water filters to install in areas, where people don't have enough money to buy clean drinking water, he offered me to help straight away and set up a meeting with one of the community leaders in no time. We also organized a beach clean up in the Krui area and without the help of Christian it would have not been the same. 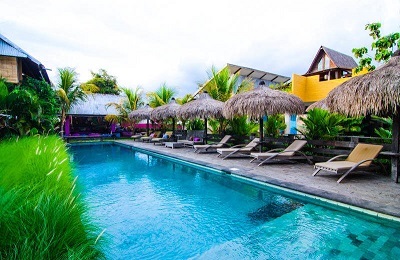 Combining a local atmosphere and Indonesian vibes with a little bit of Western comfort, Krui Surf Camp was one of the best places for me to stay and I will definitely be back hopefully more sooner than later." Greatest Surf Camp of Indonesia! "I had only good experiences with the Surf Camp! Florian and Christian are very friendly hosts and the waves there are really great for beginners and pros! I highly recommend this place to all people who love to surf!! "